Millais posed his second daughter Mary for this image of a young girl sitting bolt upright, stirred by birdsong. 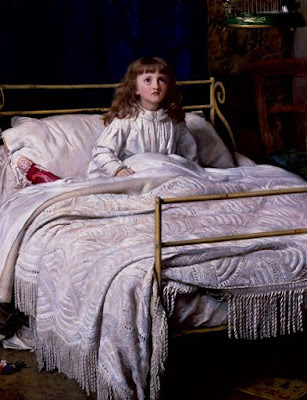 It represents a blended stylistic approach: the heavy knitted blanket and its tasselled edge bunched around the bed frame rendered with Pre-Raphaelite precision, the decorative bands of colour and abrupt cropping more indicative of Aestheticism. Quel beau rendu , c'est magnifique ! EB . Wonderful isn't it. I found it on thr Tate Gallery site.